But now my rotund little friends are here! And these parfaits I’ve been dreaming about are too. They were every bit worth the wait. Rose petal preserves could not be easier to make at home — not much more than lemon juice, sugar, water, and rose petals, and the result is a stunning, ruby-red confection with a heady perfume that makes me think of Edmund and enchanted Turkish delight. 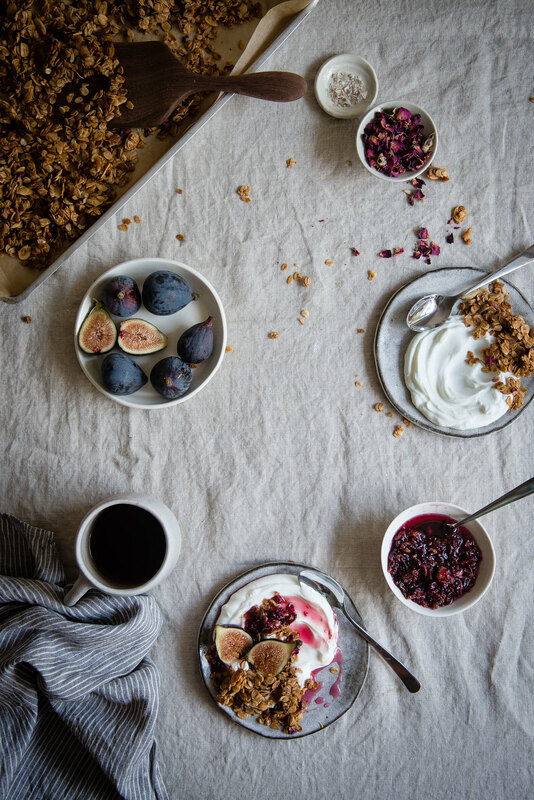 Because I can never get enough rose anything, the granola has roses in it, too — adapted from this gorgeous recipe I’ve been meaning to try from the impeccable 101 Cookbooks. And, just like I imagined, a few cut figs add a pure, clean sweetness and a softness of texture that seamlessly ties it all together. Mixed up with a good quality Greek yogurt (or some Vermont Creamery fromage blanc, a new discovery! ), it makes for a light but satisfying dessert or an indulgent breakfast. Or both, like I’ve been having it lately. I hope you’re having a wonderful home stretch of summer! If you figure out how to make it last forever, let me know. 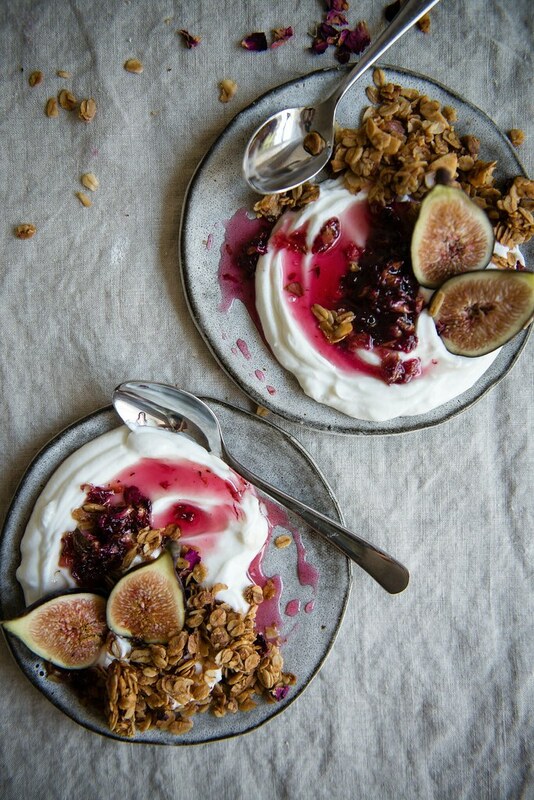 Fig, rose & almond granola parfaits. Yield: 1 8-oz jar rose preserves, 3 cups granola. 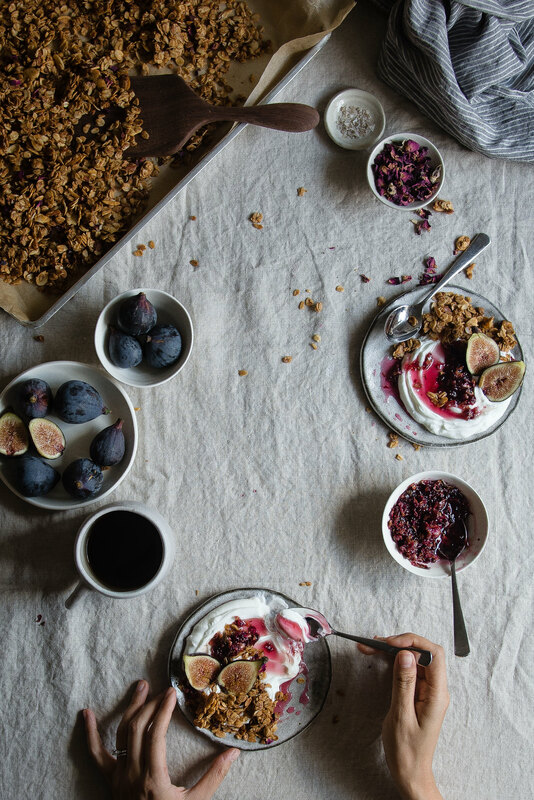 The rose petal granola is barely adapted from this marvelous recipe by 101 Cookbooks, with almonds instead of walnuts (for no reason other than I like them) and without currants. 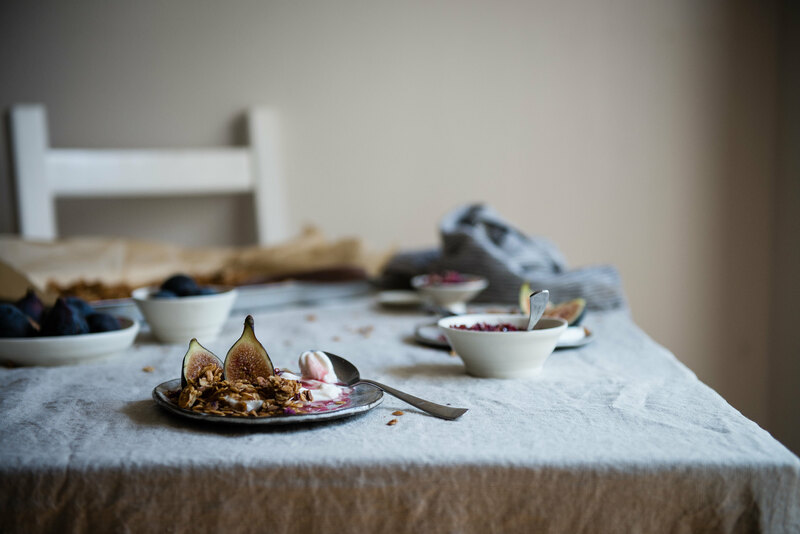 The black pepper originally gave me pause, but don't be like me and don't be tempted to omit it -- it's the kind of extra touch that makes me marvel at the skill of other bloggers out there, and it brings out the floral notes in the granola in the most surprising, and amazing, way. To make the rose petal preserves: First, pick over the rose petals to remove any leaves and separate the petals to ensure they release the most flavor. If using fresh petals, wash thoroughly. Combine the sugar, water, and rose petals in a large saucepan over medium heat and stir until the sugar dissolves. Bring to a boil, then cook for 10 minutes. Add lemon juice and rosewater, if using, and continue to cook for 3-5 more minutes, or until syrup begins to thicken slightly and bubbles form a pink foam on top. For a syrupy preserve, remove from heat and jar. For a jammier, thicker consistency, add the pectin and continue to cook for 3-4 more minutes. Take care not to overcook -- even with the pectin, the consistency will still be somewhat liquid when hot, and will set much more upon cooling. I preferred mine a bit looser since it mixes into the yogurt nicely that way and gives a little room for error in cooking. Either way, pour into sterilized glass containers, seal and let cool completely or chill. To make the granola: Preheat the oven to 300 F and line a baking sheet with parchment paper. Combine the oats, almonds, salt, pepper, and half of the rose petals in a large mixing bowl. Heat the butter in a small saucepan over low heat until melted, then stir in the honey until combined. Remove from heat and whisk in the rosewater. Pour the honey mixture over the oat mixture and stir until oats are well-coated, at least 30 seconds. For a clumpier granola, stir in the egg white. Spread the mixture evenly across the baking sheet. Bake, stirring once or twice, for about 35 to 40 minutes, or until the granola is toasty and deeply golden. You may want to rotate the pan once to ensure even baking. Remove from the oven and press down on the granola with a spatula to form more clumps. Let cool completely, sprinkle with the remaining dried rose petals, then store in an airtight container at room temperature. 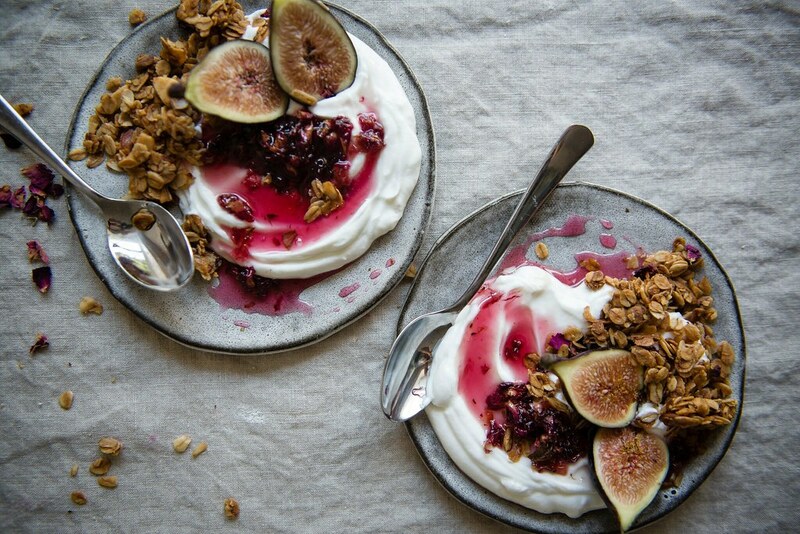 For the parfaits: Assemble Greek yogurt, granola, rose petal preserves, and sliced fresh figs in the amount of your choice. Enjoy! 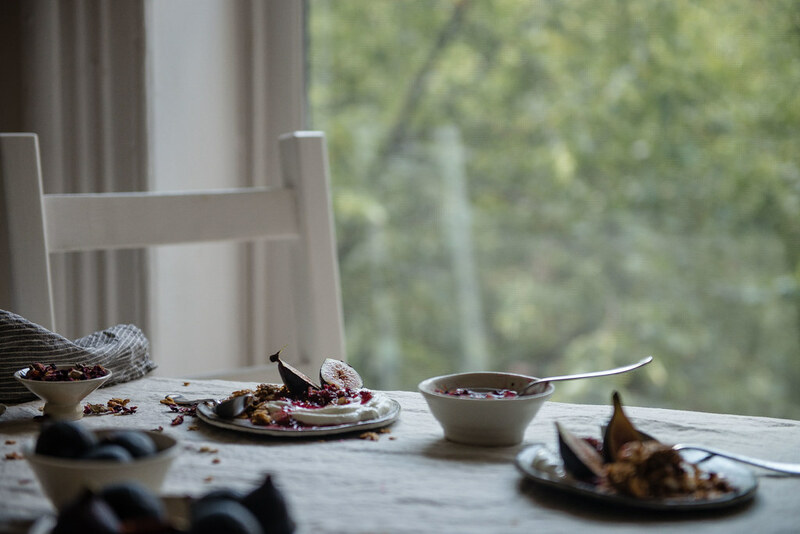 If using dried petals, the resulting preserves will be a bit chewier than with fresh petals. This didn't bother me too much, but if you'd like it to be softer, soak the petals overnight in 1 cup of water, then use the petals and water to make the jam the next day. Wonderful, Cynthia, can’t wait for breakfast tomorrow! Thank you so much, Aimee!! I’m so awed by all the flavor combinations you create! So pretty! I can only imagine how fragrant this is. What a lovely breakfast! Hi Cynthia, this is absolutely beautiful. Thanks so much for sharing it (your photos are exceptional). Wow, this recipe is a work of art. Just beautiful. I’m so curious to try these flavors all together. Such creativity! Oh my goodness! Edmund! Cynthia you have completely brought back all kinds of memories from my childhood and gave the most exact flavour profile a set of words could possibly deliver. Thank you so much for this totally gorgeous recipe! Ummm hello, most gorgeous colors EVER. I want to frame one (or all) of these, Cynthia! Oh these pictures are gorgeoussss! I found some figs last week, but they were a little sad looking, so I had to pass on them! Oh wow! What a fun and delicious spin on granola! yum! Those photos.. my.. oh my.. 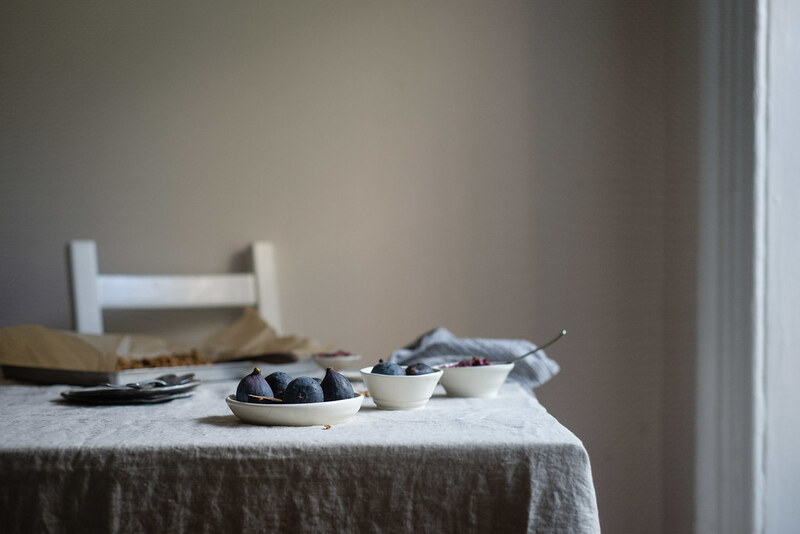 I absolutely love that photo of the figs on the table.. It is a thing of beauty and so is this parfait. I could eat that granola by itself. I could not be more excited about this—everything I love in one place! Beyond the beyond. I’m making everything!!! Thank you, C.
These pictures are stunning and that rose petal preserve has my name on it. Must try this before fig season is over. I’m been pining for fresh figs to show up at my local market for months. Here’s to hoping this week will be the long-awaited week! I can’t wait to try this gorgeous recipe! This is the most beautiful parfait I have ever seen – an instant classic, Cynthia! So dreamy!! Hip, hip hurray for fig season! This breakfast looks utterly beautiful! Rose petals and figs are both ingredients that I have hardly used so would love to try this when fig season arrives here in the Southern hemisphere next summer. 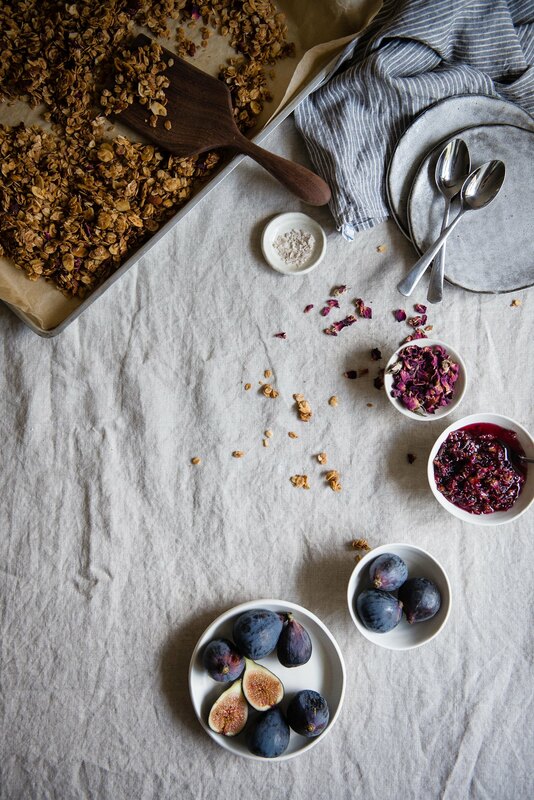 Love the idea of infusing the granola with rose petals too – such a gorgeous combination of flavour, scents, textures and colour! soooooo gorgeous. 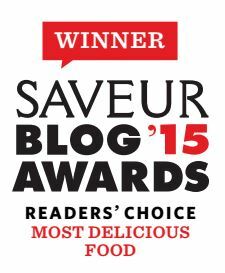 rose petal preserves?! UGH. I love it. Cynthia, the way you described the rose petal preserves made me melt in my chair a little. That scene with Edmund and the Turkish delight is one of my favourite literary food scenes- I remember reading it (I nearly typed eating it, clearly a Freudian slip) as a child and just wanting, so badly, to try one. When I finally tried one in Turkey a few years ago, they were good, but nowhere as good as the ones described by C.S. Lewis! 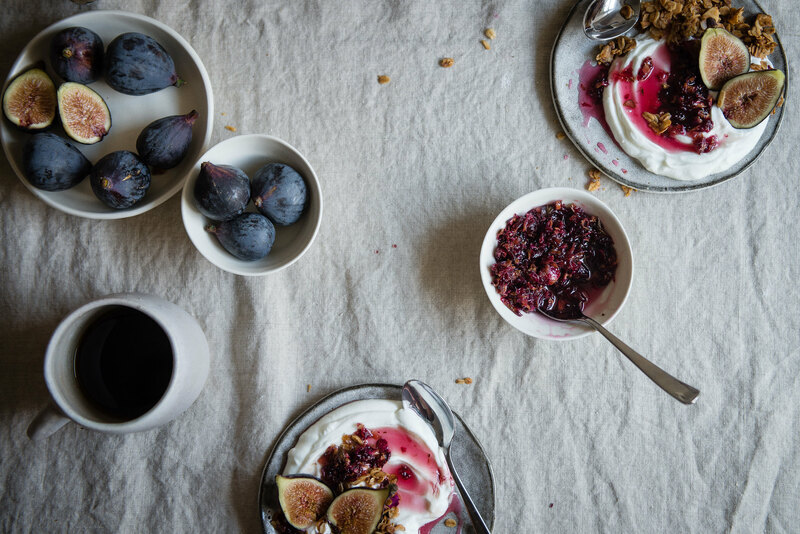 I’m a huge fan of figs too and am so excited to bring some home so I can make these parfaits! This is SO gorgeous. I love it. You’ve totally convinced me about black pepper + rose petals. I’m allergic to almonds but I’d imagine substituting pistachios (which I can eat) would be really good too. I need to make some granola soon :). Cynthia, I was just as excited as you when I first saw figs at our local outdoor market. Figs are such a special fruit and somehow you made them even more so. Really beautiful post! I love the way your mind works, my friend. I’m always in awe of how creative, inventive and unique your recipes are. And girl, your photo styling is on point. These photos are absolutely gorgeous (the deep rich colours of the figs and rose preserves just jump off the screen). Beautiful pictures, I love the rose petal preserves!! i am obsessed with yogurt granola parfaits and yours is absolutely the most beautiful i’ve seen!!! the figs look absolutely luscious. The rose petal preserves- so elegant! And I am PUMPED for figs, I have literally been daydreaming of loads of figgy recipes all week. Where did you get your table linens and towels? Hi Tiffany, the tablecloth is this one from H&M and the tea towel is this one from Fog Linen! This is quite amazing! Beautiful pictures! i love love figs! this time of year is so exciting, although like you said, it reminds me that fall is not far off and that’s pretty sad. i never want summer to end! but the figs definitely make it easier. black mission are my favorite- they’re so incredibly lush and sweet that savoring them fresh is probably the best thing you can do. although omg- in this granola?! they must be amazing!! 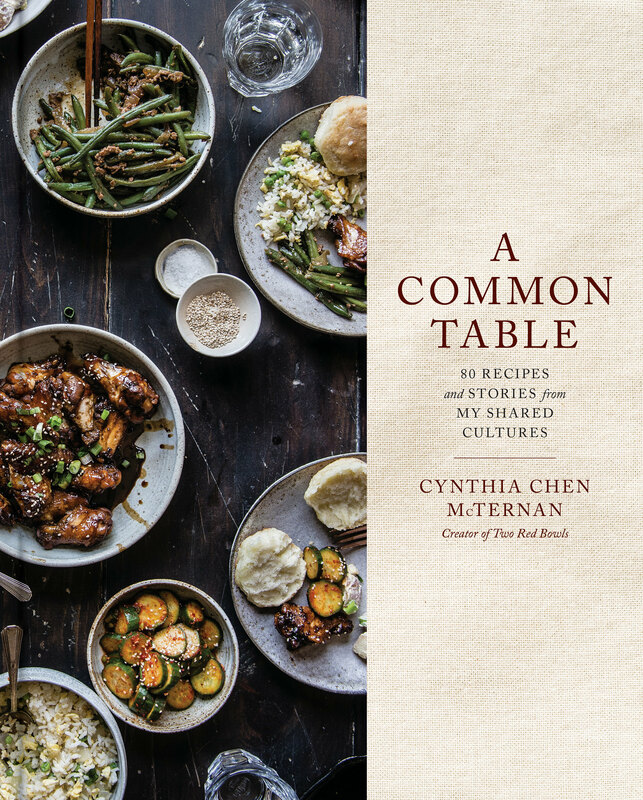 This recipe is insanely gorgeous, Cynthia!! I remember visiting my friend in San Ramon in the early fall and we picked figs off of the neighbors tree and I was like CALIFORNIA IS A MAGICAL PLACE. The color on those rose petal preserves makes me weak in the knees!! Stunned by how lovely this is! Oh my WORD. Now to get ahold of some Rose petals…. Wow this looks so fresh and clean. this is absolutely gorgeous! my mouth is watering 🙂 you’re so insanely talented! Sounds divine…viva la rotund purple friends! This is one of those desserts that is *almost* too pretty to eat…love it so much!